I have but two words for Planet Lovetron TV Show rehearsals. Excellent Job! David E. Nabinger Jr., Jason Mallery, Billy Stokes, Automatic Maddox, and Jasmine Stokes. But don&apos;t take my word for it. Check out the opening of the Pilot as performed by Suspicious Behavior with me as the MC. 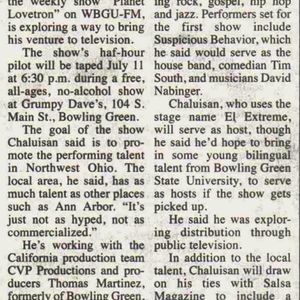 Bowling Green Business Supports Mr Salsa&apos;s Planet Lovetron TV Show. Ohio based and Puerto Rican founded Juliet Sky Wine, Bowling Green Deli Entrepreneur Lori Hanway and Dave&apos;s Cosmic Sub are providing the Hors d&apos;oeuvres and refreshment for the VIP Guest Audience July 11th, Grumpy Dave&apos;s Pub 6:30 Doors open David Harper.